Figure 1. Adult citrus leafminer, Phyllocnistis citrella Stainton. Photograph by Lyle J. Buss, University of Florida. A widespread Asian species (Clausen 1931, 1933, CAB 1970), described from Calcutta, India (Stainton 1856), CLM is known from East Africa — Sudan to Yemen (Badawy 1967), and through southern Asia — Saudi Arabia to India (Fletcher 1920) and Indonesia (Kalshoven 1981), north to Hong Kong and China, Philippines (Sasscer 1915), Taiwan (Chiu 1985, Lo and Chiu 1988), and southern Japan (Clausen 1927). It is also found in New Guinea and nearby Pacific Islands (CAB 1970). It was introduced into Australia before 1940, and by 1995 had spread across the continent (Beattie and Hardy 2004). CLM also occurs in South Africa and in parts of West Africa (CAB, personal communication). In the Western Hemisphere, CLM was first discovered in Florida in May 1993 in several citrus nurseries in Homestead other parts of Miami-Dade County, and in Broward and Collier counties. Since then, it has spread to all Florida citrus counties. By 1994, it had spread to Alabama, Louisiana and Texas (Nagamine and Heu 2003). By 1995, the citrus leafminer was discovered in Central America, western Mexico, and several Caribbean islands (Jones 2001). In 2000, it arrived in southern California from Mexico (Grafton-Cardwell et al. 2009), and was first detected in Hawaii on Oahu, spreading to Kauai and Maui in 2001 and Molokai and Hawaii (the Big Island) in 2002 (Nagamine and Heu 2003). 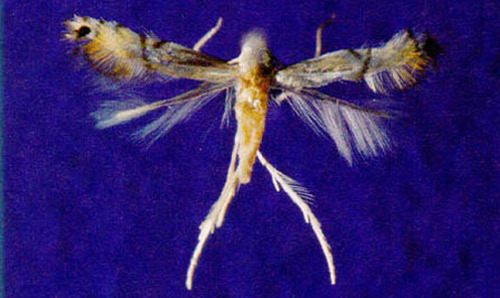 Adults of the CLM (Figure 2) are minute moths with a 4 mm wingspread. They have white and silvery iridescent scales on the forewings, with several black and tan markings, plus a black spot on each wingtip. The hind wings and body are white, with long fringe scales extending from the hindwing margins. In resting pose with wings folded, the moth is much smaller in appearance (about 2.4 mm). The head is very smooth-scaled and white, and the haustellum has no basal scales. CLM is most easily detected by its meandering serpentine larval mine, usually on the ventral side of the leaf. Larvae are minute (up to 3 mm), translucent greenish-yellow, and located inside the leaf mine. The pupa characteristically is in a pupal cell at the leaf margin. Adults generally are too minute to be easily noticed, and are active diurnally and in the evenings. Figure 2. Pinned adult citrus leafminer, Phyllocnistis citrella Stainton, (4 mm wingspread). Photograph by Jeffery W. Lotz, Florida Department of Agriculture and Consumer Services, Division of Plant Industry. 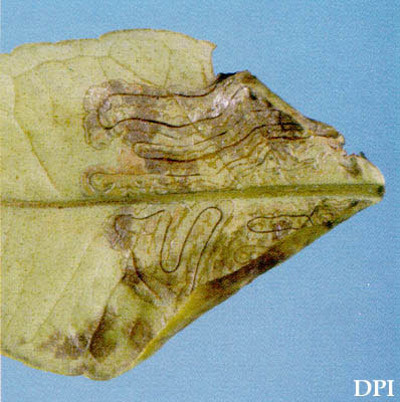 As with similar leafminers, larvae are protected within the leaf during their feeding cycle. Larvae have four instars and development takes from five to 20 days. Pupation is within the mine in a special pupal cell at the leaf margin, under a slight curl of the leaf. Pupal development takes six to 22 days. Adults emerge about dawn and are active in the morning; other activity occurs at dusk or night. Females lay eggs evenings and at night (Badawy 1967, Beattie 1989). CLM may help spread citrus canker (Hill 1918, Ando et al. 1985) because of leaf damage from the mine. Generations per year appear to be nearly continuous: six in southern Japan (Clausen 1931), nine to 13 in northcentral India (Lal 1950), 10 in southern India (Pandey and Pandey 1964). Development time totals about 13 to 52 days (Pandey and Pandey 1964). Depending on foliage flushing cycles and weather conditions as many as six to 13 can be expected (Jones 2001). Adults live for only a few days. In Florida, a new generation is produced about every three weeks. The larvae form serpentine mines in the leaves (Figure 3) and rarely fruit of their hosts. These mines are filled with a central line of frass. 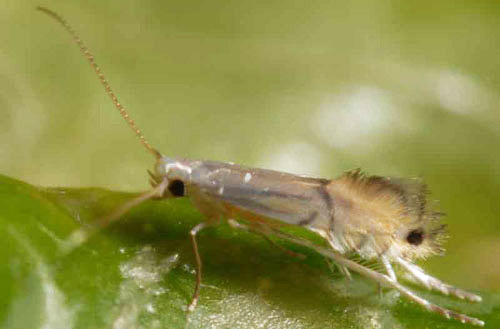 This characteristic helps separate this leafminer from the citrus peelminer. The citrus leafminer larvae only infest the younger, flushing foliage. Adults lay their eggs on both the upper and lower surface of the leaves which are less than 1.27 cm (1/2 in) in length. Reports from Australia indicate infestations of one to three mines per leaf, while wetter conditions in other areas, such as Florida, may support more miners per leaf (Jones 2001). succulent branches of green shoots may also be attacked (Beattie 1989, Pandey and Pandey 1964). Figure 3. Leaf mine of citrus leafminer, Phyllocnistis citrella Stainton, on citrus in Florida. Photograph by Jeffery W. Lotz, Florida Department of Agriculture and Consumer Services, Division of Plant Industry. In Florida, biological control and applications of oil are suitable methods to help reduce populations of CLM. Natural enemies already present in Florida have responded to leafminer infestations, causing up to 90% mortality of larvae and pupae. These natural enemies include the introduced parasitoid Ageniaspis citricola that is established throughout most of Florida and is responsible for up to 30% of this mortality mostly later in the year (Rogers, Stansly and Stelinski 2009). Apparently, Ageniaspis citricola was introduced into Hawaii at the same time as the citrus leafminer. Since then, Ageniaspis citricola has spread to all the islands and provides good control (Nagamine and Heu 2003). As a result, treating with insecticides may affect parasites populations and growers should consult with state experts on the timing and frequency of such treatments (Grafton-Cardwell and Montez 2009). Beattie GAC. 1989. Citrus leaf miner. NSW Agriculture & Fisheries, Agfact, H2. AE: 41-4. Commonwealth Agricultural Bureaux (CAB), Commonwealth Institute of Entomolog. 1970. Phyllocnistis citrella Stnt. In Distribution maps of pests. Ser. A, Map No. 274. The Eastern Press Ltd., London, England. Originally published as DPI Entomology Circular 359. Updated for this publication.